Every UK County (or equivalent metropolitan body) has to provide a records repository where key historical documents - including parish registers, are deposited, together with a suitably equipped reading room. HALS was set up several years ago by combining the Hertfordshire County Records Office and the County Local Studies Library. It is situated at County Hall, Hertford, and an area with microfilm and microfiche readers has been set aside for family history research. HALS is the official repository for Hertfordshire parish registers, but access to these is now on microfilm (except for some modern ones) to preserve them so unless you live locally you may find it more convenient to view the films at your nearest LDS Family History Centre. They also have many other documents from parish chests. A list of its holdings is available online. It also holds most Hertfordshire wills and again a list of its holding are available online. Its online newspaper list also includes papers held in local libraries. In addition it holds an unbelievably wide collection of other documents on matters relating to Hertfordshire - some of which are relevant to the family historian. Nearly all of HALS' books are catalogued and online on Concerto (available through HertsDirect) and a large number of archive catalogue entries are on A2A (the Access to Archives database). The book Tracing Your Family History in Hertfordshire is an essential introductory guide to the material they hold. HALS holds a copy of the national register indexes of births, marriages and deaths, but order for certificates should be made from the Hertfordshire Registrar - link on the Hertsdirect page. Hertfordshire Names Online is an essential tool and new sources are continually being added. Just a few of the additions in 2012 include Hertford Petty Sessions convictions between 1869 and 1911, Hertfordshire Reformatory School log books (1892-1901) and St Albans Workhouse registers (1835-1854 & 1900-1902). What was life like for people in Stevenage at the end of the 19th century and how had political, industrial and rural changes affected people's lives? The database is made up of over 200 sources - including census returns, parish and farm records, maps, directories, photographs, newspaper articles, Board of Guardians and medical records, school log books and local committee papers - to enable students to explore and investigate life in Stevenage in the last decade of the 19th century. What did Hoddesdon look like at the end of the nineteenth century? If we travelled from the 21st century back along the High Street a hundred years ago what would we see, hear and smell? What could we buy? What has gone? What has survived? Investigate some of the ways the local area has changed using a database of sources including the 1891 census, photographs, directories, maps, newspaper articles and advertisements. 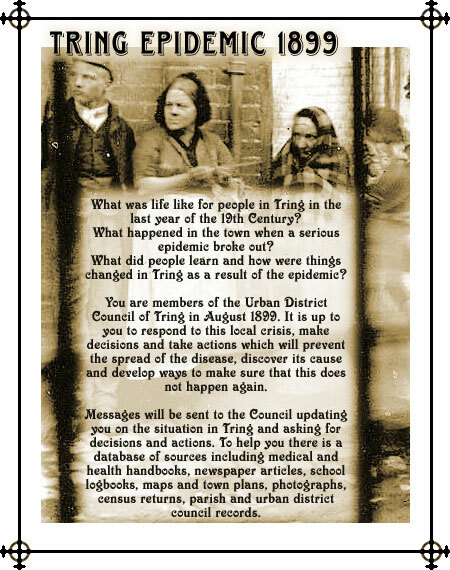 This is an interesting project, based on real events and with copies of a wide range of documents including letters to and from the Council, and relevant reference material. There is also a teaching data base that I have not fully explored but which includes the prisoners in the County Goal at St Albans in the 1891 census. A selection of photographs from the HALS collection is printed in the book Images in Hertfordshire.